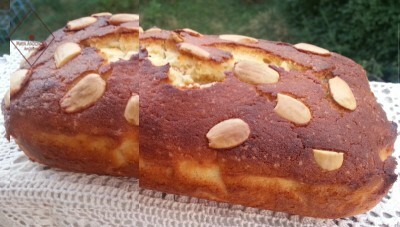 The lemon almond bread is baked in a rectangular baking mold. Butter the sides and bottom and cover it with baking paper. Cream the butter and castor sugar in a mixer. Gradually add the yolks and Mascarpone whitted cream, beating well. Add the sifted flour and salt, using a spatula. Add to the batter the grated lemon zest, lemon juice, ground almonds and once again mix for a while with a spatula. At the end, add in the well beated egg whites and castor sugar. Pour the ready mixture in the mold, smooth the top and decorate with whole almonds on top. Bake in a preheated oven at 180 C for about 45 minutes. After removing it from the oven, take it out from the baking mold. Bread is philosophy – it is made with lots of love!